The vendor landscape of the global market for refurbished medical imaging equipment features a largely concentrated nature in established regional markets such as Europe and North America, with companies increasingly focusing on expansion in untapped regional markets for better growth prospects, observes Transparency Market Research in a recent report. As such, focus on strategic alliances with domestic medical device companies has significantly increased. Companies are also ploughing more funds into activities aimed at improving their repair facilities and expanding their operations to be able to process larger volumes in face of increased demand. Some of the leading vendors operating in the global refurbished or remanufactured medical equipment market are Koninklijke Philips N.V., GE Healthcare, Atlantis Worldwide LLC., Siemens Healthineers AG, Canon Medical Systems Corporation, and Fujifilm Holding Corporation. According to the report, the market is expected to register a promising 5.4% CAGR over the period between 2018 and 2026, rising from a valuation of US$ 903.2 mn in 2017 to a revenue opportunity of US$1,443.3 mn by 2026. Geographically, the market in North America is presently the leading revenue contributor to the global market, thanks to the high concentration of several leading players and the vast rise in R&D activities concerned with refurbishment practices for medical devices. In terms of end-user, the segment of hospitals continues to account for a dominant share in the market. Refurbishment is a highly organized practice for inspecting the efficacy and safety of a used equipment so that all safety parameters are met before the equipment can be reused, without changing its use as per original registration. For an equipment to be qualified as refurbished or remanufactured, its life of operation also plays a vital role. 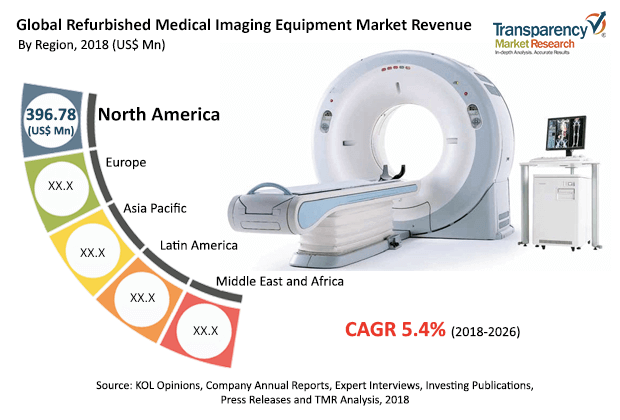 The high demand of refurbished medical imaging equipment in developed as well as emerging economies like Brazil, China, and India is a prime driver of the global refurbished medical equipment market. The report states that the global demand for refurbished medical equipment has seen a significant rise in the past few years along with a strong growth in the demand for new medical equipment. Until only a decade ago, refurbished medical equipment were mostly exported to developing countries, through suppliers who were not professionally well trained. These factors hindered the overall growth of the global refurbished medical equipment market. Nevertheless, cost containment in healthcare budgets in developed countries like the U.S. and many countries in Europe owing to sluggish growth of economies has triggered the demand for refurbished medical equipment in these regions in the past few years. There has also been a surge in the number of trained professionals in this field, benefitting the global refurbished medical equipment significantly. Besides cost-related factors, the rapidly expanding global population of geriatrics is also a key factor driving an increased demand for refurbished medical equipment to supplement the increased number of surgical procedures. The number of private healthcare institutions has also increased across the globe, adding significantly to the overall demand for a variety of new as well as refurbished medical equipment. Some of the key restraining factors for the market are no support from government bodies, inefficient policies regarding reimbursement, and strong regulatory policies. This analysis of the global refurbished medical equipment market is based on a recent market research report by Transparency Market Research, titled “Refurbished Medical Imaging Equipment Market ( Product - CT Scanners, MRI Systems, X-ray Systems, Ultrasound; End use - Hospitals, Diagnostic Centers, Ambulatory Surgical Centers) - Global Industry Analysis, Size, Share, Growth, Trends, and Forecast 2018–2026.